As an additional cost to play an event that there is a copy of in his or her heap, the Runner must pay 2credit. Based on the current meta, the only real question when it comes the heap is Chronos Project, Blacklist or this? The answer, as always, is complicated. Under no circumstances should one underestimate the power of this card once the runner has pitched a few noteworthy events into the bin: 2 makes all the difference in the world when it comes to events, especially econ. With a nasty piece of ICE in front of it, the runner can be sorely pressed for credits when they most need them. That said, there's one clear deck type this is meant to ruin: Prepaid Kate. No other deck in the meta runs anywhere near as many events. With that in mind, let's look at the rival asset, NBN's Blacklist. Blacklist covers every possible type of recursion and flat out stops it (even going to far as to use the phrase "for any reason", not a common occurrence in modern CCGs!). Furthermore, comparing the price between the two we get 2 vs 0. That may not seem like a ton, but if you've just been vamped or siphoned, you may not be able to rez this when you just KNOW they're going to Same Old Thing. Comparing assets to agendas gets trickier, but as a 3/1, we can see that Chronos Project is quite an easy piece to pop off, and unlike Blacklist or SL, it solves the problem permanently. It fits quite nicely in the same mid-game slot as SL, but only continues to grow in usefulness as more cards are added to the heap, whereas SL notes a drop off in effect every time the runner plays their last copy of an event. End of the day, it's still not a bad little asset to punish a cheeky Kate with, but considering how rampant Clone Chips and other forms of non-event recursion are in general, one may be better served slotting either of the other two to cover the field. This card is about slowing down your opponent without them really realising it. It's much like an actual student loan (own experience, sigh). The additional cost of 2credits might not look that impressing, but lets take a closer look. This card can slow down the runner in many different ways, so you have more of an opportunity to score your agenda's. -Runner gains less of a profit (some economy events get pretty much useless like Easy Mark, Career Fair and Dirty Laundry). -The event can't be used when the runner has 5 credits: He or she will have to have 7 credits before being able to use it. 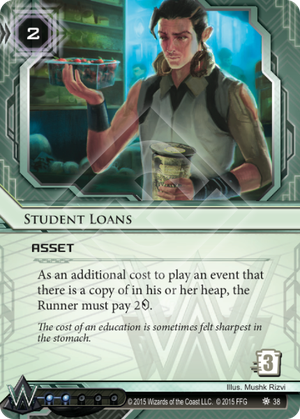 Maybe that doesn't seem like a lot, but it can really slow a runner down if the runner doesn't have (a lot of) economy cards set up. He might have to spend clicks to gain up to 7 credits before the runner could use the event to make more money. This pretty much goes for all economy events such as Lucky Find, Three Steps Ahead and Day Job. -It now takes the runner 3 runs, spread out over 3 turns, before this card gets profitable. By the time that happens you might have already been able to get rid of the current. -Currents might not be worth the credits, since currents don't usually stick around for many rounds. Cards such as Scrubbed (most likely profitable after 2 rounds), Traffic Jam, Itinerant Protesters and Hacktivist Meeting might just not be worth paying 4 credits for, since the currents won't stay in game that long. You (probably) won't be able to stop certain attacks on your servers with this asset, but it will be taxing for the runner to keep playing the same events. Think events like from the silverware collection, Spooned, Forked and Knifed. Some events might get played with a few credits less (which can make all the difference) because of the tax they'd have to pay- think events like Vamp or Account Siphon and Running Interference. And don't forget it's taxing on Escher, Early Bird, Inside Job and Indexing. Special Order, Test Run, Retrieval Run, Scavenge and similar events of which there are (usually) multiple copies in a deck get just a little less appealing to play. -The downside of this card is the obvious, it only works on events that have already been played once during the game. -The low trashcost means you'll probably have to keep this at least under a somewhat protected server.